Hi everyone, Flat Katie here. I'm giving Real Katie a rest today so I can tell you more about BlogPaws. One of the paws-down COOLEST things Glogirly and I experienced was the Catification Lounge that Moderncat's Kate Benjamin put together with her pal (yes...she KNOWS him) Jackson Galaxy. This is Kate Benjamin a.k.a. Miss Moderncat with Moki The Wobbly Cat and ME. Coincidence that Kate's name is just a little *i* away from mine? I don't think so. Everyone knows that Moderncat.net features the coolest products for the most discriminating modern cats. There's a ton of great Catification Lounge photos on Moderncat's website. At the end of the conference they had a drawing and EVERYCAT won a prize! Even the Flat Cats! 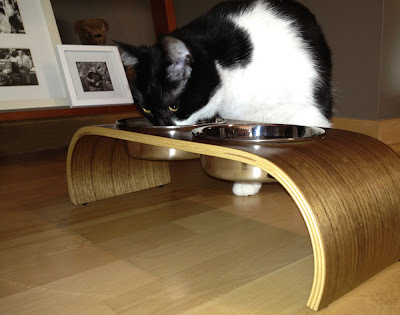 Check out my stylish new elevated feeding bowls from Vurv Design. They are perfect for this modern cat's townhome don't you think? Real Katie is a little standoffish at first. An approach from the rear is probably best. Success. And Real Katie says, "My food tastes so modern!" TOMORROW IS THE LAST DAY TO VOTE!!! Don't forget to vote to nominate your favorite pet bloggers for the Petties 2012 Awards! Voting is open until June 29 and one lucky shelter or rescue organization could also win a $10,000 donation. Click HERE for one of two ways to vote - through Facebook or by using your email! If you want to nominate us for Best Video or Best Blog Post, you'll need the specific URL's. Click HERE for a list of our faves. LOVE the Moderncat feeding bowls - gorgeous! Almost as much as I love the little green X. Awesome! 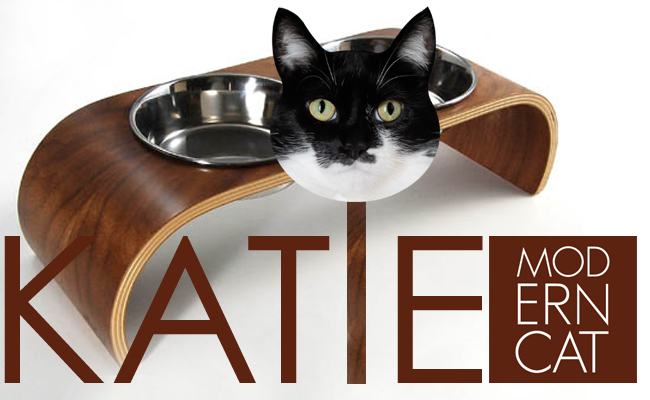 love the sleek design of the feeder and it appears that Katie does too!! It DOES go great in your townhouse! Kate features the best of the best on her site and is super nice to boot! Wow, if we had bowls like that we'd be as cool as our Grete woofie (she has a bone design on her bowl holder). So exactly what does modern food taste like...sushi? great design,very sleek just like you katie you lucky girl! Whoa! I could only see the green X. So modern! purrr...meow! 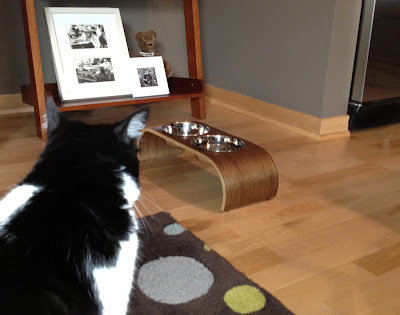 That is a very nice elevated feeding bowl. Blends in so nicely with the home. That is a totally awesome and stylish dining setup! Sadly, I think such a pretty place setting would guarantee Binga stealing my food! That's a pawsome set of bowls!! We also noticed that you're not only modern but also modest!! That is a fancy feeding place. We need one with 15 dishes in it then, everyone could eat all in a line. That is really nice. Take care. Modern Cat is so cool! Just like you two Katie and Glogirly. I'm happy to see Glogirly using photoshop to preserve Katie's dignity! We are glad you got brave and tried it out Katie! It does look purrty marvelous! Hmmm I wonder if Plush cats won prizes too?! I haven't heard. Love your new feeder. It's a great piece of furniture for Katie. Modern, yet functional. That is a cool feeder. My mommy was sad she couldn't make it to blogpaws. But we're glad Glogirly enjoyed it and that you got some cool stuff! Those bowls look great, Katie! Do they make your foods taste better?? Katie you are so stylish and oh so modern!!! Flat Katie did good - I hope that real Katies is sharing with her! Well aren't you all fancy schmancy. Do you still want to even talk to us?